I went up to Amy's yesterday. We headed up to Sumter for a little shopping and lunch at Five Guys (yum!!). 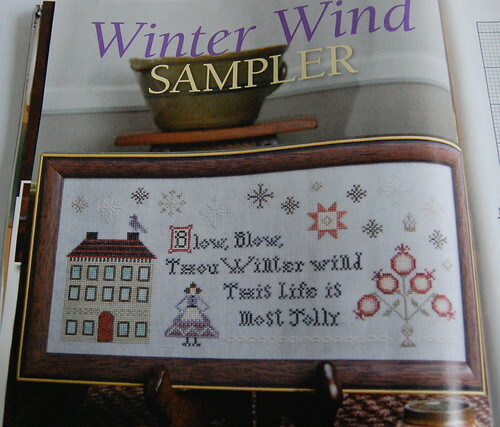 While there I picked up the latest Just Cross Stitch magazine from DSL. I also got my buttons for "The Stockings." But it will be set aside for a little bit because I'm working on another model for Lisa right now. It's such a great design! I'll give you a sneak peek of the threads and fabric... they're just gorgeous! 40 ct. Vintage Autumn Gold by Lakeside Linens, NPI silks. I hope to have it finished before we leave for Florida next Saturday. Wish me luck! :) Write soon! This issue really looks good. 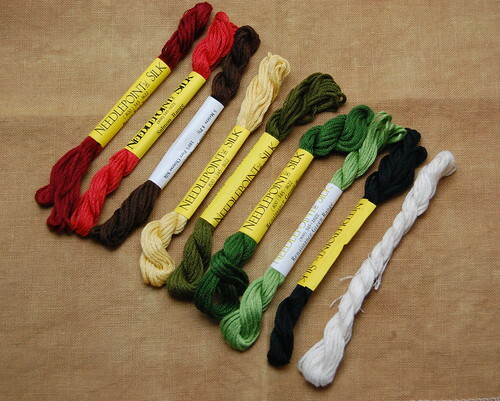 Your stockings will be perfect, the colors are gorgeous! Thanks for the JCS review - I thihnk I will have to buy that one! Can't wait to see Lisa's design! And, you bad girl!--I took one look at the JCS issue you showed, through on my coat and drove directly to the LNS, whereupon I bought the magazine, and then did a silk conversion on the spot, two minutes before they closed! Thanks! I picked up a copy of JCS yesterday as well and it is a great issue. It was definitely good to see Paulette featured. 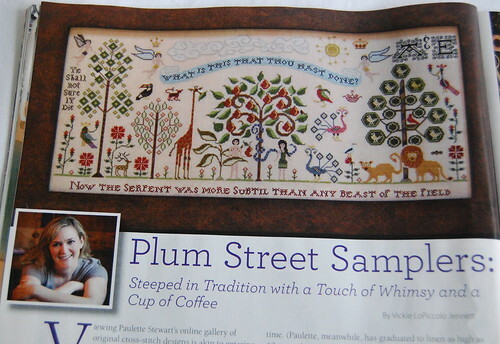 LOVE that new one by Paulette ... will have to pick the issue up for that design. Beautiful and love the saying. Tanya, who LOVES Five Guys! Thanks for the heads up on this one. I can't wait to get that issue now!! So exciting! Love your SB WIP too! Love the JCS preview and can't wait to see the model. The colors are fabulous :-). 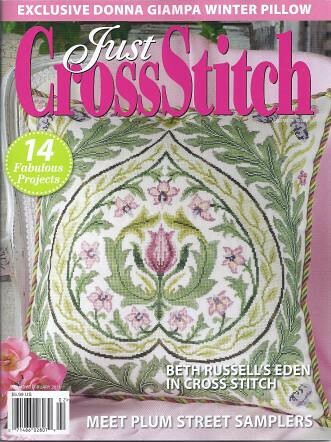 Just Cross Stitch is THE best magazine out there in my opinion. 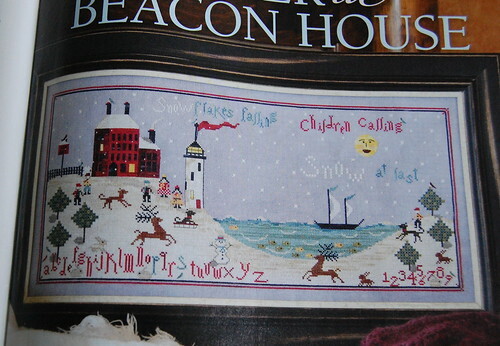 I love the fact that they are incorporating more popular cross stitch designers. I can't wait to get mine now! 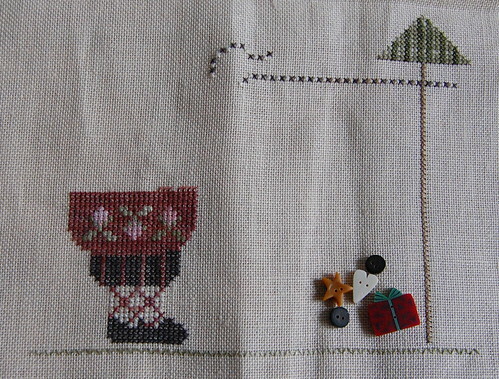 I LOVE that Praiseworthy Stitches design. I may have to start that one as my next larger project.